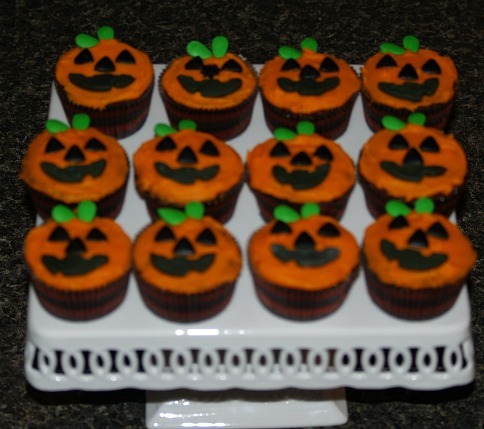 Learning how to make Halloween treat ideas is something I love to do each year. The fall time of the year has always been my favorite time of the year. It might be the pretty colorful leaves on the trees or simply the fall aroma in the air. The smell of wood burning in the neighboring fireplaces and the crispness in the lightly blowing winds make me want to be walking through the woods or in the kitchen baking. 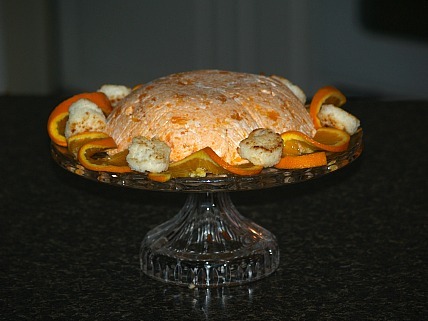 Since I married many years ago, I have always tried to learn how to make new Halloween treat ideas. Before my children were old enough to enjoy “trick or treating” I loved making all kinds of treats for my little visitors. Even though I consider this a “pagan holiday”, it was a time for me to give to the little neighbors. I would make cookies, candies, popcorn balls and more to fill bags which I purchased so I could give each child a bag of treats. 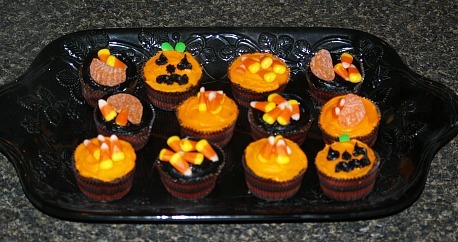 When my children became of school age I began learning how to make Halloween treat ideas for their parties at school. Back then all this was possible until some very mean people spoiled this practice for all the kids. It became so dangerous for the kids to accept treats that it was cancelled until people like the local police came up ways of sharing their Halloween treat ideas. One year I had prepared about 200 bags of Halloween treat ideas before I realized none of the children would be out to gather treats. I had three teenager and that was it! I had no idea what to do with all these goodies so I called the local children’s’ home. They were more than willing to use my bags of treats since they knew me. To me this was even better than giving them out to the little neighbors. Apple harvest brings back many great memories of my past and one of the reasons I love the fall season. The best thing about apple harvest is making those delicious candy apples with caramel or cinnamon candy; it might be a fall treat or one of the Halloween treat ideas. For Halloween it is always fun to dress the candy apples up a little. 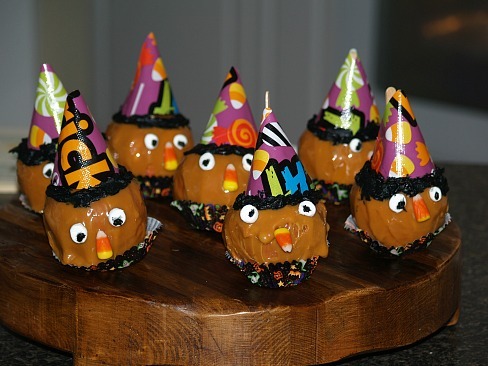 Below is a recipe to make cute caramel apple witches. Remove papers from caramels and melt with water in 1 ½ quart saucepan over low heat stirring until smooth. Wash and dry the apples; insert stick into stem end of each apple. Dip each apple into hot caramel; turn until coated. 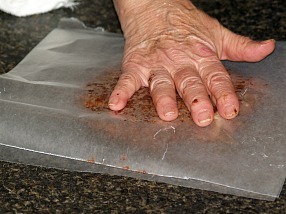 Scrape caramel from bottom of apples and place on buttered wax paper. NOTE: I like to dip bottoms of coated apples in crushed peanuts and place on large muffin paper liners; the peanut keep the caramel from sticking to the paper. Use the candy corn to create the witches nose; the marshmallows and other candies for eyes and mouth. Make a pointed hat from bright Halloween colored paper around the stick leaving opening for the wooden stick. 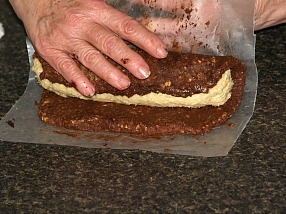 Sift together the flour, sugar and cocoa powder. In a pan heat the butter and Coca Cola to a boil; pour over the dry ingredients and mix well with a spoon. Add the salt, buttermilk, eggs, vanilla and baking soda; mix well with spoon. Bake at 350F degrees about 12 to 15 minutes until done. Let cool completely before frosting. Makes about 30 cupcakes. NOTE: This recipe can also be baked in a 9 X 12 inch baking pan. 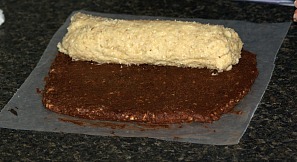 Whichever way you choose, the recipe will rise during baking but becomes flat on the top. It is a deliciously flavored chocolate and very moist cake. 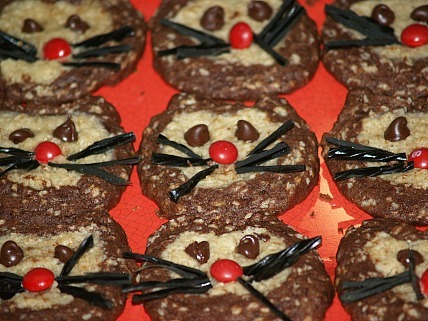 These cute little cookies have been one of my special Halloween treat ideas for many years. They are made with a delicious oatmeal recipe; half is flavored with chocolate. 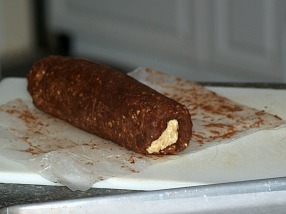 The trick is to roll the regular half in a cylinder and then roll it inside the chocolate half. After that it is a breeze! Cream butter, shortening and sugar in a mixing bowl. Add eggs one at a time beating well after each; beat in the vanilla. Combine flour, baking powder and salt; gradually add to the creamed mixture. Stir in the oats until well blended. 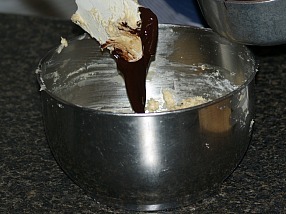 Divide the dough in half; add the melted chocolate to one half. 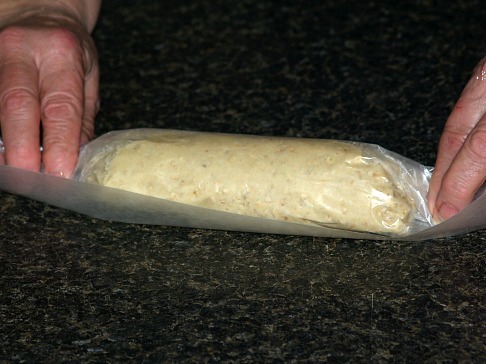 Roll the plain dough into an 8 inch log in wax paper; set aside. 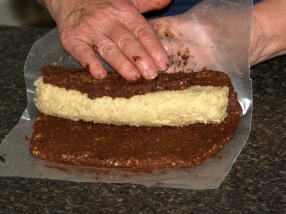 Roll the chocolate dough into an 8 inch square between pieces of wax paper. 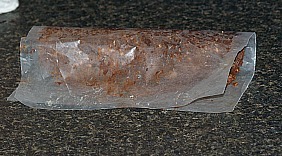 Place log at one end of the square and roll up; wrap in plastic wrap. 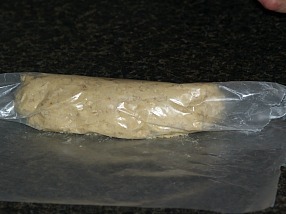 Place dough in refrigerator for at least 3 hours. 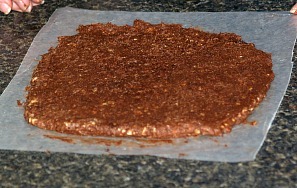 Slice dough in ¼ inch slices and place on ungreased cookie sheets. 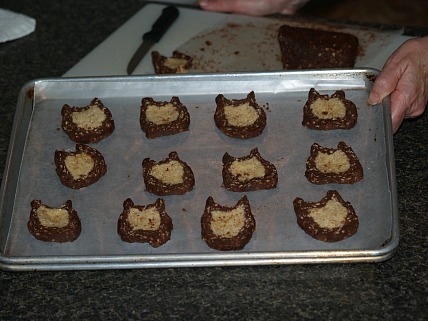 TO MAKE CAT EARS pinch triangles at top of cookies. 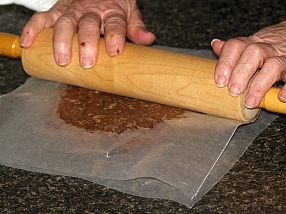 Bake at 350F degrees about 8 to 10 minutes or until dough looks dry and set. 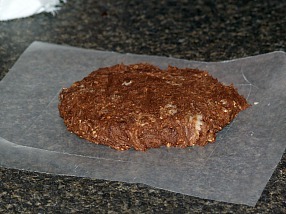 NOTE: I line my pan with wax paper to bake these cookies; no grease. NOTE: I make 20 cookies from my log; some people slice them thinner to get more cookies but I feel mine are of a perfect size. IMMEDIATELY after baking place 2 chocolate chips for the eyes, red candy for the nose and 6 pieces of licorice for the cat’s whiskers (By the time I got to the whiskers the cookies had cooled some so I uses a little sharp knife to help put on the whiskers. This recipe can be added to your Halloween treat ideas if you are planning a special lunch or dinner. 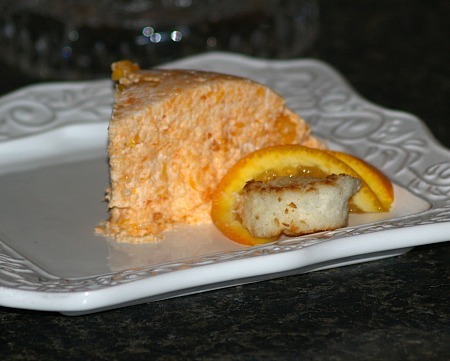 With all the other sweets surrounding this day, this dessert is light but flavorful. Dissolve Jell-O in the boiling water; break cookies in pieces and add to Jell-O. Whip the cream until stiff and fold into mixture. Pour mixture into a mold and chill until firm.